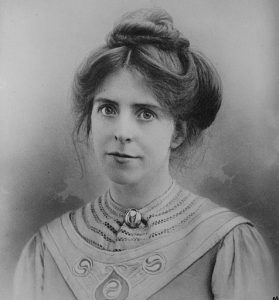 A previously unknown letter from local suffragette, Annie Kenney, is now on public display for the very first time. 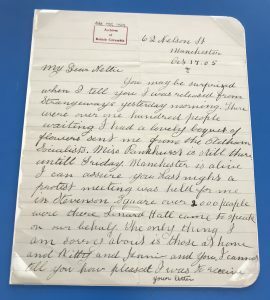 The letter was written following Annie’s release from Strangeways Prison in Manchester, where she had been imprisoned with Christabel Pankhurst. She comments on the warm reception she received, with more than 2,000 people gathering in support, and exclaimed that ‘Manchester is alive’. She was grateful for the support from her family, although worried that another sister, Alice, was ‘awfully angry’ about the incident. Annie wrote the letter at the Pankhurst family home, 62, Nelson Street, Manchester. She became one of the Pankhurst’s most loyal supporters. The letter has lain unknown for more than a century in the British Columbia Archives at the Royal British Columbia Museum, in Victoria, Canada. Nell Kenney, the recipient, had moved to Canada, and her papers had been filed under her married name, Sarah Ellen Clarke, so it had escaped attention. It was recently located by Lyndsey Jenkins, a historian from the University of Oxford, who was researching the lives of the seven Kenney sisters. The letter is temporarily on display in our Oldham Stories exhibition. From the 29 September it will be become part of the Gallery’s new ‘Peace and Plenty? Oldham and the First World War’ exhibition.